Michelle Sidor has made 750 field goals, 395 three-pointers and 290 free throws in her three-and-a-half year career so far at Saddle River Day. Each of those buckets, plus the incalculable hours spent in the gym, culminated Tuesday night when Sidor became the fourth-ever girl in New Jersey history to score 3,000 career points. The dream became a reality after Sidor’s red-hot high school career start. 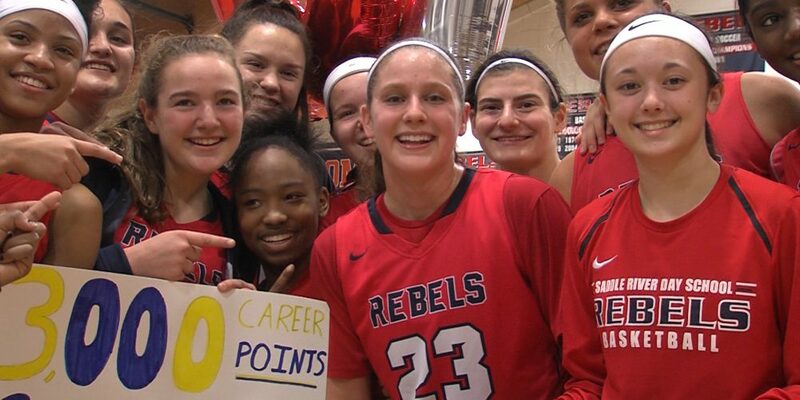 She scored her 1,000th point as a sophomore, broke the 2,000 point barrier as a junior and eclipsed the all-time Bergen County scoring record just a few weeks back. Sidor joins St. Peter’s Kristen Somogyi (3,899), Wildwood’s Monica Johnson (3,173) and Belleville’s Jen Apicella (3,105) as the fourth girl in the 3,000 Point Club. And there’s plenty more on the horizon for the Michigan basketball commit. Sidor very well could end up the 2nd all-time scorer in state history — for both boys and girls — if Saddle River Day makes the postseason push its fans expect.